HB 1571 did not get voted out of the Senate Energy, Environment & Telecommunications (EET) committee and is dead. The bill passed out of the House on Feb. 10 and was heard in the Senate EET committee Feb. 23. HB 1571 was initiated by the national paint manufacturing industry trade association, the American Coatings Association (ACA). HB 1571 would have created a collection program for the recycling or proper disposal of unwanted architectural paint in Washington state, similar to industry-operated PaintCare paint stewardship programs around the nation. A recent report on the success of PaintCare highlighted that local governments saved an average of $151,905 annually under PaintCare, retailers are highly satisfied, and paint recycling is more convenient under PaintCare. Paint stewardship legislation was first introduced in Washington in 2013, making this the fourth year in a row the Washington Legislature has not passed a bill which has the support of paint manufacturers, environmental organizations, and Washington local governments. The Northwest Product Stewardship Council would like to thank the many businesses, nonprofits, local governments, and other organizations that have taken the time to contact their legislators and testify in support of this legislation. 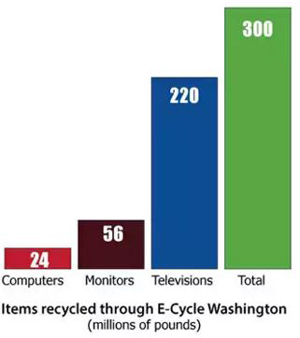 In the seven years since E-Cycle Washington's 2009 start, the manufacturer-run product stewardship program has recycled over 300 million pounds of TVs, computers, and monitors, keeping an estimated 20 million pounds of lead out of landfills. Under Washington state law, manufacturers pay for the proper recycling or disposal of their products and consumers can recycle their used TVs, computers, laptops, tablets, monitors, e-readers and portable DVD players at no cost. An article in Waste 360 comparing the differences among state electronics laws said that it "is safe to say, none of the state EPR programs comes close to the program implemented in the state of Washington." Washingtonians recycled more than one million fluorescent tubes, compact fluorescent lamps (CFLs), high intensity discharge (HID) lamps and other mercury-containing lights since the LightRecycle Washington program launched Jan. 1, 2015. LightRecycle topped its 2015 goal by 4%, recycling 989,034 lights, then surpassed 1 million lights in January 2016. LightRecycle is a manufacturer operated product stewardship program run by PCA Product Stewardship, a nonprofit, and overseen by the Washington Department of Ecology under the state's mercury lights law. LightRecycle allows individuals and businesses to recycle up to 10 mercury-containg lights per day at over 220 collection sites throughout Washington – find a location near you. PaintCare and the Product Stewardship Institute (PSI) released a revised Request for Proposals (RFP) to conduct research on the measurement of, and strategies for, reducing the generation of post-consumer architectural paint. The results of the study will enable PaintCare to measure progress toward post-consumer paint source reduction and set source reduction goals. The objectives of the project are to: develop a methodology to measure the amount of post-consumer paint; utilize the methodology to compare changes in the amount of leftover post-consumer paint over time; and make recommendations for strategies to reduce the generation of post-consumer paint. Responses are due April 15 and an open Q&A session will be on March 17. In an article in Environmental Leader, "to promote the circular economy in the US and eliminate waste, the Ellen MacArthur Foundation has launched a US chapter of its Circular Economy 100 (CE100) program."